Hola a todos. 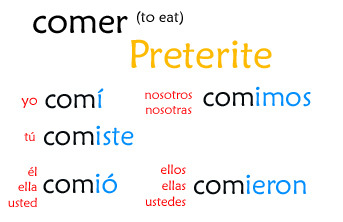 In this lesson, we’ll be continuing with the preterite. This time, we’re covering regular -er verbs. But just like with -ar verbs, the -er stem changers can be lumped into this group as well. Irregulars are a completely different story and those will eventually be covered! Enjoy! Let me know if this video lesson was helpful. Also, questions/comments/suggestions are welcome! Check out the preterite conjugation sheet if you’d like a summary of the preterite! i understood a bit of what the guy is saying. printed off the list just to study over break if i need to and just as a small dictionary. I watched the video and wrote down the vocab for notes. Soo watched the video twice first time was confusing but got it the second time..
Wrote down vocab on notecards. The Video was helpful and i understood it well. Yo compredi el vocabulario rapido. The video went really fast but I went back a couple times and wrote down all the examples. I also wrote down the vocab. It was helpful and the video allowed me to understand the concepts. do i get 5 points for watching this? The video was helpful with conjucations. I wrote the vocab down to learn from later. I liked how he gave a lot of examples to help better understand the concepts. Watched the movie and took some notes. Wow…best online source of spanish lessons I have seen. I understand your lessons crystal clear. Great job! ( I wish I could rewind myself back to highschool spanish and check out your class haha). Sr. Jordan saved me from failing my spanish final. my spanish teacher is useless. Thank you soo much!!! U da bomb!! I’ve been trying to learn Spanish for years but the past tense completely tripped me up repeatedly! Your lessons are the best I’ve found. I’ve been through about 25 courses in my life. As soon as I cease being unemployed, I’m sending you a really good donation! Thank you Sr. Jordan! You helped me in understanding the verb conjugating and for watching your videos my teacher is giving me Extra Credit! Yo, this video is fire. So helpful dood.